A casual reader or Trek fan should not take a Star Trek novel lightly these days, especially when the novel is set on the late 24th century. Novels released by Pocket Books starting early 2000s fall into some sort of a continuity which fans call the “Novelverse” where events in one book might be referenced in another or a meta-story can drive the plotlines of multiple books. Some authors may or may not follow the novels continuity (you can spot continuity slip-ups and ret-cons here and there) but the story in the novels strive to be self-contained. Continuity may be good or bad for the books but some (like me) appreciates this and wants to follow where the new Star Trek lit universe go. 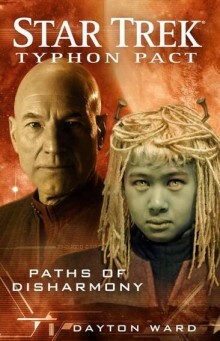 Paths of Disharmony is written by Dayton Ward and is part of the Star Trek: Typhon Pact miniseries featuring the characters from Star Trek: The Next Generation. Captain Picard was sent by Federation President Nanietta Bacco on a diplomatic mission to Andor. The reproductive crisis of the Andorian people was compounded by the devastation of the cities of the planet following the last Borg Invasion. Leading Andorian scientists struggle to solve the crisis with one solution seems promising but later discarded when number of failures became higher than successful births. The Enterprise’ task is to bring leading scientists from the Federation and non-aligned worlds to a conference on Andor to help solve the crisis. If your last Next Gen story was Star Trek Nemesis, here are some pointers on the current crew of the Enterprise. Will Riker left to command his own ship, the USS Titan. Counselor Troi followed Riker on Titan. Data’s twin, B4, is not on board. Worf stayed as Picard’s first officer. LaForge is still the chief engineer. Picard filled in the missing posts with new officers trying to find the perfect mix but almost every novel there is a change in the line-up. In this novel, the following are new faces are significant characters: Choudhurry the chief of security, Taurik a Vulcan assistant chief engineer, and T’Ryssa Chen a half-Vulcan contact specialist. By the way, Picard is already married and there is a little Picard crawling around. The plot revolves around Andorian politics and the reaction of the Andorian people following the Borg Invasion to the Federation. Some groups felt that the Andorians was forsaken by the Federation or outright against the Federation. Some groups protesting that the new solution for the reproductive crisis is un-Andorian. When the Tholians, member of the Typhon Pact, announced that the possible solution to the crisis was held secret by the Federation the protests turned into violence, the Enterprise was caught in the middle but was able to quell both camps. In the end, the decision of Andor will rock the core of the Federation while the Typhon Pact watches. The miniseries Star Trek: Typhon pact was supposed to feature a member of the new coalition called Typhon Pact that serves as the counterpart of the Federation. In this book, it is only revealed that the Tholians are doing something behind the scenes. Since the Tholians are already featured in the series Star Trek: Vanguard, I understand why they are not featured in full here. This book also features the Andorian Thirishar ch’Thane back to the TrekLit although not much of “airtime” as I liked it to be. I hope his character will be revisited soon and in a Deep Space Nine book. I get the feeling that Pocket Books is slowly closing the gap between the novels and the prime universe segment of the Star Trek (2009) movie, specially the Star Trek: Countdown comic by IDW. There are hints on the future role of Picard. On that note, I want a Data/B-4 story! The novel started slow but it picked up the pace sometime after the midpoint up to the big decision near the end. I want to read the aftermath of this book soon. Quick rating: 3 Borg Cubes (out of 5).